The next section contains a detailed analysis of the rugged embedded system market across various countries in the region. It provides a market outlook for 2018–2026 and sets the forecast within the context of the rugged embedded system market, which includes latest technological developments as well as offerings in the market. This study discusses key trends within countries contributing to growth of the market, as well as analyses the degrees at which drivers are influencing this market in each region. Key regions and countries assessed in this report include North America (U.S., Canada), Latin America (Brazil, Mexico, & Rest of Latin America), Europe (UK, France, Germany, Italy, Spain, Russia, & rest of Europe), SEA (India, Indonesia, Philippines, Malaysia, Thailand, Oceania, and rest of SEA & APAC), China, Japan, and MEA (GCC Countries, Turkey, South Africa, Northern Africa, & rest of MEA). This report evaluates the present scenario and the growth prospects of the rugged embedded system market across various regions globally for the period 2018 –2026. We have considered 2017 as the base year and provided data for the remaining 12 months. Rugged embedded systems are designed to perform reliably in harsh environments. A harsh environment presents inherent characteristics, such as extreme temperature & radiation levels, very low power, strict fault tolerance, and security constraints that challenge computer systems in their design and operation. In this report, PMR has segmented the global rugged embedded system market on the basis of type, application, and region. By type, the market is subsegmented into rugged computer systems, rugged storage systems, rugged network switches & routers, and rugged power supplies. Rugged computer systems are in demand for ensuring optimum performance on the field and to operate under extreme conditions such as high-temperature, moisture, and pressure. 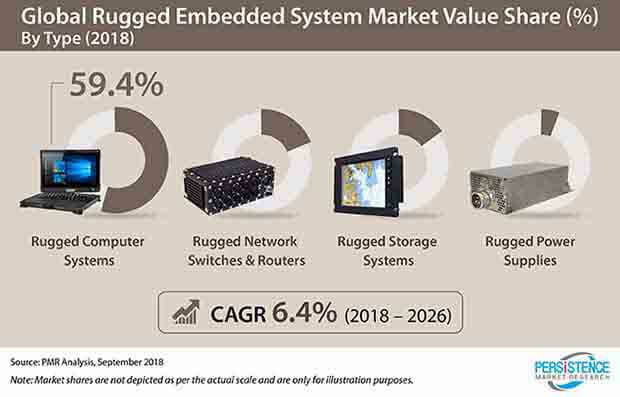 Owing to this factor, the rugged computer systems subsegment is projected to register more than 55% of the market share at the end of 2018 in the global rugged embedded system market. Furthermore, the rugged computer system subsegment is also expected to grow at a relatively higher CAGR during the forecast period in the rugged embedded system market and is expected to create an incremental opportunity of US$ 1,656.6 Mn between 2018 and 2026. Apart from this, the rugged network switches and routers subsegment is also expected to grow at a high CAGR during the forecast period as the demand for rugged network switches and routers is increasing due to growth in wireless and network-centric operations. Furthermore, this segment is expected to create an incremental opportunity of US$ 506.2 Mn during the forecast period. Increasing modern electronic warfare & network-centric operations and increasing government expenditure in military operations are the primary factors fuelling the growth of the rugged embedded system market. Moreover, the increasing use of wireless and cloud computing technologies in the military have also led to an increase in the demand of rugged embedded systems. Furthermore, the increasing utility of multicore processors & wireless technologies and growth in the application of remotely operated vehicles are among factors driving the rugged embedded system market. Based on application, the rugged embedded system market is subsegmented into military & defense, aerospace, and industrial. The industrial segment is further subsegmented into oil & gas, power distribution, mining, and others. The growing demand for rugged embedded systems in oil & gas and power distribution industries due to the growing need for rugged embedded systems that work in low energy as well as in harsh environments is driving the industrial subsegment. In addition, the industrial subsegment is expected to capture large market share in the global rugged embedded system market. Military and defense applications are expected to grow at a relatively higher CAGR during the forecast period. On the basis of geography, the rugged embedded system market is segmented into various regions, which include North America, Latin America, Europe, China, Japan, SEA & Others of APAC, and Middle East & Africa. The North America rugged embedded system market is expected to dominate the global rugged embedded system market due to advancements in next-generation communication technologies in the region and high spending in military and aerospace by the U.S. The region has witnessed the widespread deployment of wireless and cloud computing technologies in the past couple of years. These factors are fuelling the growth of the rugged embedded system market in North America. Moreover, the rugged embedded system market has high potential in SEA & Others of APAC and China owing to an increase in investments in research & development for applications in military & defense and the onset of modern warfare systems in various countries of the region. According to PMR analysis, long-term contracts with government entities & organizations and collaborations between the rugged embedded system manufacturers are likely to increase revenue and new innovation strategies to enable rugged embedded system manufacturers to reach new growth markets. Some of the market participants in the global rugged embedded system market report include Advantech Co., Ltd.; Kontron AG; Curtiss-Wright Corporation; Siemens AG; Microsemi; Crystal Group Inc.; Abaco Systems; Beckhoff; Systel, Inc. and Syslogic.